The first day of spring still has a dirty reminder of winter. Many corners across southeast Wisconsin are piled high with filthy snow — the last gasp for winter to hang on. "It's so gross," Dan O'Connell said. "It's really not a good thing to have." "It's an eyesore for one," Taylor Layton said. "It's impeding traffic as well. "Seeing some cigarette packs, paper products. That's terrible." Those dark, dingy mounds of muck will be gone before long. While people are happy to see them go, it's not all good news for our fresh water. "It's like a tidal wave of pollutants going into our rivers and lakes after these big thaw sessions," said Jake Fincher, storm water program manager for Sweet Water. The dirt, trash and other elements in the snow mounds will go through storm drains and make its way into the Milwaukee river basin. During this time of year, fresh water advocacy group Milwaukee Riverkeeper tests the water. They typically find high levels of chloride after winter rock salt makes its way into the runoff. "That is pollution," said Jennifer Bolger-Breceda, executive director of Milwaukee Riverkeeper. "Aquatic life, fish, little crawly critters in the river can't survive when chloride levels are high. They live in a non-saline ecosystem. That amount of road salt in our waterways can be very toxic to wildlife." 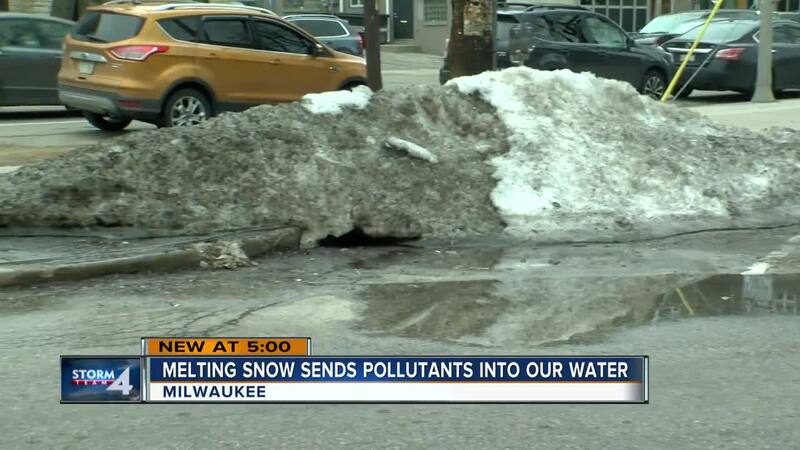 It's not just Milwaukee's salt going into the river basin. From Fond du Lac to South Milwaukee, the snow melt gets into local rivers and eventually makes its way to the lake. Between 2002 and 2015, samples taken in December, January, February and March exceed chronic standards. February had more than 42 percent of samples exceeding chronic samples, while March and January go between 21 percent and 23 percent, respectively. But it's more than just salt. "We have a lot of other concerns, too," Bolger-Breceda said. "We're concerned about phosphorous. We're concerned about bacteria. We're concerned about sediment. Think about water as the air for aquatic life, and if there's a lot of dirt in it, it's like air pollution for aquatic life." But she's not just worried about the wildlife. "This is our drinking water source," Bolger-Breceda said. "People may or may not know that. Milwaukee gets its water from Lake Michigan. Over 40 million people rely on the Great Lakes and the ecosystem of the Great Lakes for the drinking water. It's a matter of life." In order to make the runoff as clean as possible, Milwaukee Riverkeeper suggests not running dishwashers, washing machines or using excess water during heavy runoffs and snow melts. To know when there are heavier rainfalls impacting water treatment, text WATERDROP to 797979 for alerts. They also suggest limiting salt use next winter. Sweeping up used salt to reuse again can help prevent extra salt from getting in the waterway. Picking up after pets is also extremely important. "People didn't want to pick up because it's negative-50 degrees," Fincher said. "But it doesn't just disappear when that snow melts. That all has a lasting effect on our local rivers and lakes. Any behavior we participate in is kind of frozen in the wintertime and is released into our local rivers and lakes after it thaws out." These water advocates are looking at the disgusting snow mounds with a positive view. "In some ways, I think it's exciting because they are really good reminders to everyone whenever the big piles are uncovering pieces of litter, it helps remind people to start taking care of the watershed," said Kristin Schoenmaker, project assistant with Sweet Water. "As they wash out of the piles of snow, they can get caught on storm drains, and that's another reminder. Go to storm drains near your house and take litter out of there so the storm drains don't get clogged and flood the streets." Milwaukee Riverkeeper is hosting its 24th annual trash pick-up event on April 27. For more information, click here.